Thomas Stridsman holds firm that the key to the success of the ALFA Commodity Fund he manages lies in properly sizing its trades. He says it’s what has made it possible to beat the competition since the fund launched in mid-2010. 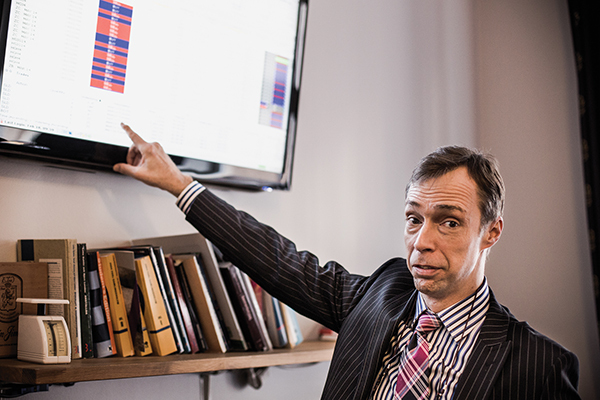 “Times have been tough the last [few] years, but if I look at my competitors, I have beaten them all,” says Stridsman, fund manager for the ALFA, one of the Alfakraft AB quantitative hedge funds based in Stockholm, Sweden. It is a trend following CTA-type fund, which is completely mechanical and systematic. The Commodity Fund focuses on commodities but also trades equity indices, interest rate instruments and currencies. Stridsman has a solid background for writing trading systems. Once a writer for Futures magazine (1996-1999), Stridsman learned a lot about trading systems from his Futures days, enough so that he wrote a book, Trading Systems That Work (McGraw-Hill). “At that time there were no books that combined entry-exit technique with money management rules and position-sizing algorithms, and I thought it was important to put something out that covered that,” he says. But when he figured out that size made the difference, he knew he was onto something. “It is way more important to know what size you should trade compared to when and what you should trade,” he says. “Too many systematic traders tend to see things in black and white. They may have a good, basic entry/exit strategy to which they try to add some type of filter to eliminate some of the worst signals, but I do not filter out anything because you never know. Sometimes the ‘worst’ set-up that should produce the worst loser will sometimes turn out to be your ‘best’ winner,” Stridsman says. Another tip: no reaction is sometimes the best reaction. The Fund’s average annual return target is 15% to 20%. It seeks a level of risk at about 13%, as measured by annual standard deviation of monthly price movements. The Fund is, therefore, considered to be a ‘medium-risk fund’. The primary aim is that the average yield level will be achieved over a period of approximately three years or longer. At the end of February 2014, the fund was up 4.1%. It earned 3.69% for 2013, after poor performance in November and December when the equity-focused traders had a great run. “We missed out on [that move] completely because we are so commodity based, but that’s the price we knew we had to pay when we decided on the overall strategy where we said that we will keep a lower portion of financial instruments in our portfolio,” he says. “When it comes to trading, I don’t think about the money that can be made, I look at the markets and building strategies as a puzzle I need to solve,” he says. “For us, sizing our trends correctly is by far the most important thing; followed by staying more commodity-focused than those who we consider to be our competitors, and finally we have decided to stick with only one type of strategy: short-term, trend-following,” he says. With proper sizing Alfa does not have to be right all the time, just at the right time, and their track record indicates they have. “You can’t win them all, you just have to win the right battles,” Stridsman adds.